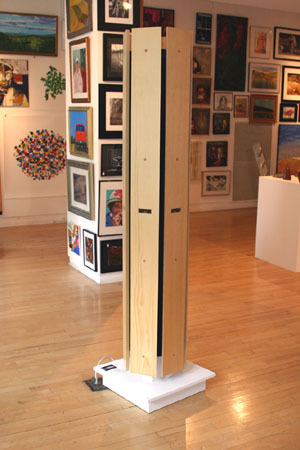 Sound Post is a self-contained audio installation that explores sacred geometry in both form and tonal modalities. I had a rather protracted development cycle on this project because the original audio hardware configuration did not quite give me the results that I was looking for. 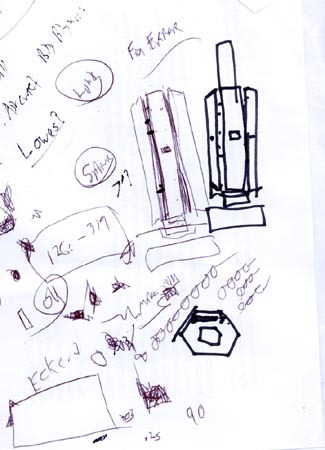 Essentially, the piece is a hexagonal column. 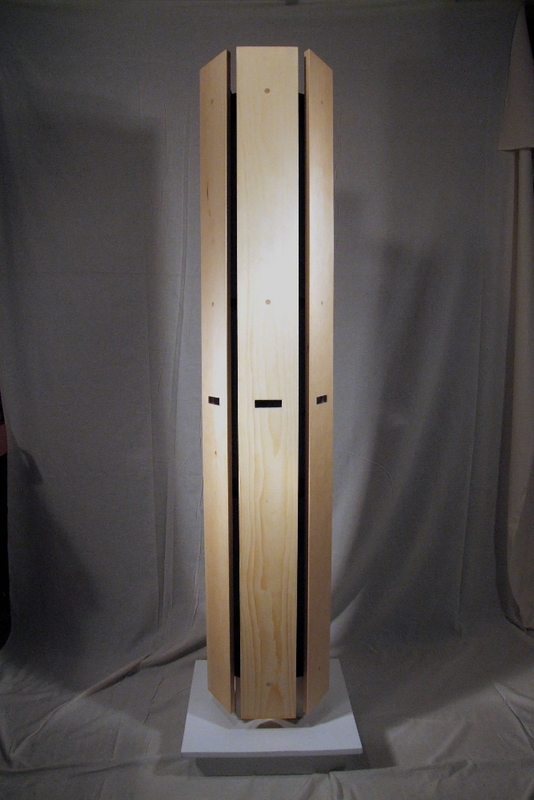 Each face of the column has an embedded IR range sensor. A person moving within four feet of the sensor will trigger a response that plays a different element of a b flat hexachord. The internal electrical components include six IR range finders, a signal processing board, an embedded Windows-based PC, a set of amplified speakers and a wireless router. The original hardware schema involved a type of left-brain, right-brain approach. Every-other sensor was wired to an off-the-shelf robotic controller (ooPIC-R). The ooPIC-R only supports four analog input lines (the processor has seven analog pins, but only four are available without modifications to the board). 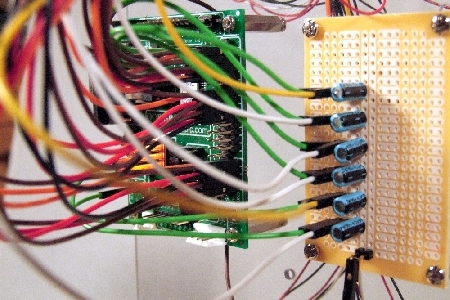 Each ooPIC was then connected via an RS232c connection to a Daisy MP3 player. The Daisy is an open-source player that is available as a kit. Each Daisy had a flash memory card with a collection of seven MP3 files with names that corresponded to the binary status of the three sensors attached to the respective ooPIC. 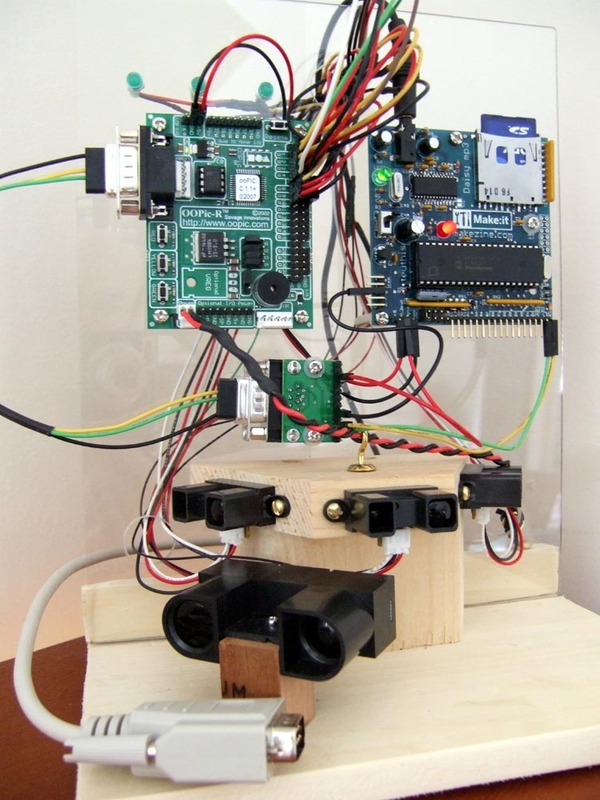 This was the first generation prototype using a robotics controller and a open-sourced MP3 player connected by a serial port. It turned out to be way too complicated and did not perform well. The larger IR sensor in the foreground is what was used in the final assembly. 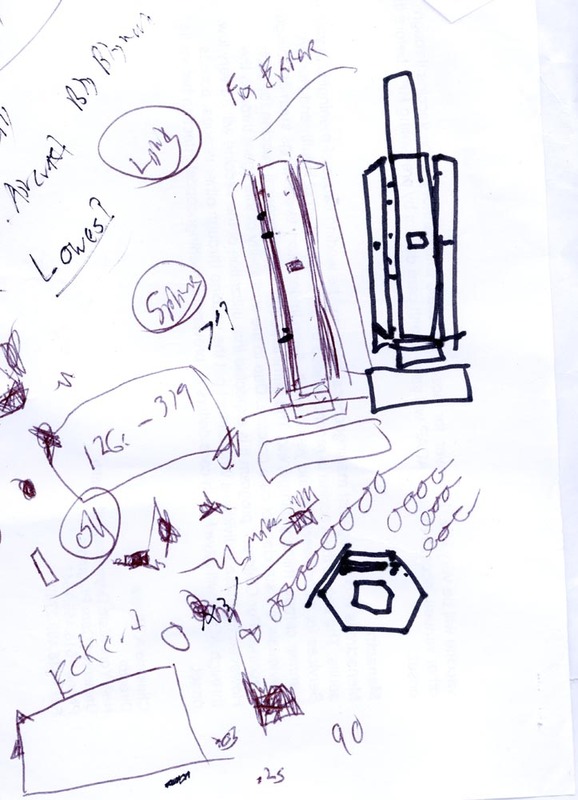 This is how the first prototype worked: Every 50 milliseconds, the ooPIC would poll the sensord and read the values to determine if there was a “target” in range. If there was a target in range (or an absence of targets), the ooPIC would send an async text command to the Daisy to play the file that sounded the corresponding combination of notes. The full prototype was built and tested with the assistance of an electrical genius who assembled the Daisy boards for me (thanks Tergis). The prototype worked as planned, but I just was not happy with the results. The track fading and switching did not function very well. The latency between tracks was much too long, the steps in the fader were audible, and there was a lot of popping in the stop function. I had also created the MP3 files with a relatively inexpensive MIDI sequencer and they lacked the dynamic range that I needed. I was trying to finish the project in time for an exhibit when one channel of the amp chip blew out on one of the Daisy boards. I was going to try to have it fixed, but I decided that it would probably be best if I redesigned the audio components to come closer to the sound that I was looking for. I let the project sit for a few months and tried to correct the problems that were evident in the prototype. During that time, I heard a track from Brian Eno’s Ambient Music – reference here. That Enos ambient music was just the sort of ethereal sound I was looking for. I bought a better MIDI sequencer and tried to come closer to the sound that I really wanted. The only to do this was to create WAV files and play them back using a high-end dedicated audio card – on-board sound chips lacked the response needed. This left me with two additional tasks – I and to build a mimi-itx format PC with an add-on sound card and had to write some software that pulled the whole thing together. Also, the prototype used a short range sensor. The range was nominally sufficient for the project, but the poor signal to noise ratio of the sensors made it necessary to go with a larger, long-range sensor to avoid false contacts. This is the final prototype. I modified the robotics controller to make six analog pins available. The original design had called for two control boards. The outboard bank of caps was necessary to filter some of the noise from the analog sensor circuits. The new system worked really well. I got the tonal quality and dynamic response that I was looking for along with very sophisticated blending and fading. I simplified the data acquisition segment by eliminating one of the ooPIC boards. This was done by removing two LED components that were occupying analog lines and replacing them with header pins. In the final design, the ooPIC used to stream continuous raw sensor readings only. All of the logic functions were assigned to the PC (an Atom-based Intel Little Falls board). The PC was attached to a wireless router. I could then monitor and reprogram as needed from a laptop. The final build and testing went well. It is easy to dwell on the technical aspects of the project, since they consumed so much of the development and construction time. The visual and audio aspects came with much less effort. The hexagon is a ubiquitous form in nature (snowflakes, honeycombs, mud cracks, lava flows). It is both integral to the stuff of the universe and transcendent. The b flat tone is also both ubiquitous and transcendent.